San Antonio, Texas, known for its Texas charm, is perched on the southern edge of the picturesque Texas Hill Country near the Mexican border. It is the seventh most-populated city in the U.S. and the second most-populated in Texas. Mexican, German and Old West culture combine here, and their influences are found throughout the city. 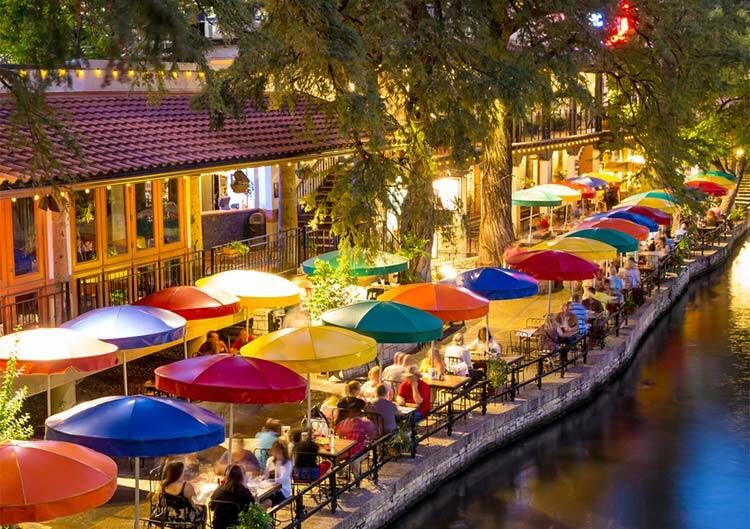 With its southern hospitality, San Antonio is an ideal destination for meetings and events. San Antonio is centrally located between both coasts, and great year-round weather, with over 300 days of sunshine each year and an in-land location provide all-weather options in all seasons. San Antonio International Airport is home to both United and American Airlines, and more than 12 branded carriers provide service to 30 markets in the U.S. and Mexico. Event Transportation Systems can provide friendly ambassadors for large groups arriving for a meeting or convention as well as shuttles to take meeting attendees to their hotels. The 1.3 million-square-foot Henry B. Gonzalez Convention Center offers endless options for any meeting or convention. It opens to the River Walk and is centrally located to 6,500 hotel rooms. Its $325 million dollar transformation, features a 514,000 square feet of contiguous exhibit space, 86,500 square feet of column-free multi-purpose space, 70 meeting spaces including divisible breakout rooms, a new 54,000 square foot Stars at Night Ballroom and the largest courtyard in the city. Other centers include the Alamodome, offering 160,000 square feet of flexible space, 16 meeting rooms and seating capacity for over 65,000 people, and the AT&T Center. For associations hosting meetings, San Antonio city sponsors a “Show Us Your Badge” program that gives convention attendees discount and special offers at over 50 restaurants and nightlife establishments in downtown San Antonio by simply showing their conference badge. In San Antonio, unique event spaces attract well-deserved attention, and are ideal locations for special programs and events. Venues include the Alamo Beer Company, America’s Incredible Pizza Company-San Antonio, McNay Art Museum, the San Antonio Museum of Art, and SeaWorld San Antonio, among many others. For a true Texas experience, meeting planners should consider planning events at the Briscoe Western Art Museum, Buckhorn Museum & The Texas Ranger Museum, Cowboys Dancehall, Don Strange Ranch of Texas, the Knibbe Ranch and the John T. Floore Country Store Honky Tonk café. San Antonio’s unique heritage and cultural mix create a one-of-a-kind culinary landscape. Although the city is famous for its signature Tex-Mex, attendees can also find traditional Mexican cuisine, along with French, German, English and Italian eateries, BBQ joins, and genuine steakhouses. The Skyline Lounge and Top of the Dome restaurants offer one of the best panoramic views of downtown and the surrounding area, and the Texas Wine Trail also winds through this region. The most visited attraction in Texas is the Alamo, one of five historic Spanish missions in the city, located just steps from the River Walk. A few blocks away sits the San Fernando Cathedral, the oldest operating cathedral in the nation. Other attractions include the King William Historic District, Tower of the Americas, La Villita Historic Arts Village, Mitchell Lake Audubon Center, San Antonio Market Square, El Mercado, Sunset Station Historic Entertainment District, Fort Sam Houston, and the quirky “Largest Boots in Texas” landmark. Five theme parks, 50+ golf courses, a dueling piano bar, the largest caverns in Texas, and sporting events include the San Antonio Spurs (basketball) and the San Antonio Stock Show & Rodeo, offer additional entertainment options. No matter where your event is held in San Antonio, count on Event Transportation Systems to provide professional, reliable and very friendly ground transportation services. We take event attendees where they need to go. Contact ETS when you’re planning a convention or meeting in San Antonio.